There were two specific types of points I wanted to use for my South Africa trip: Avianca LifeMiles and Alaska Airlines Mileage Plan miles. I had an uncomfortably high Alaska Airlines Mileage Plan balance, and there is an astonishingly good award on their chart. It’s only 70,000 points from the US to Johannesburg on Cathay Pacific in first and business class (first class to Hong Kong and business class onward to Johannesburg). 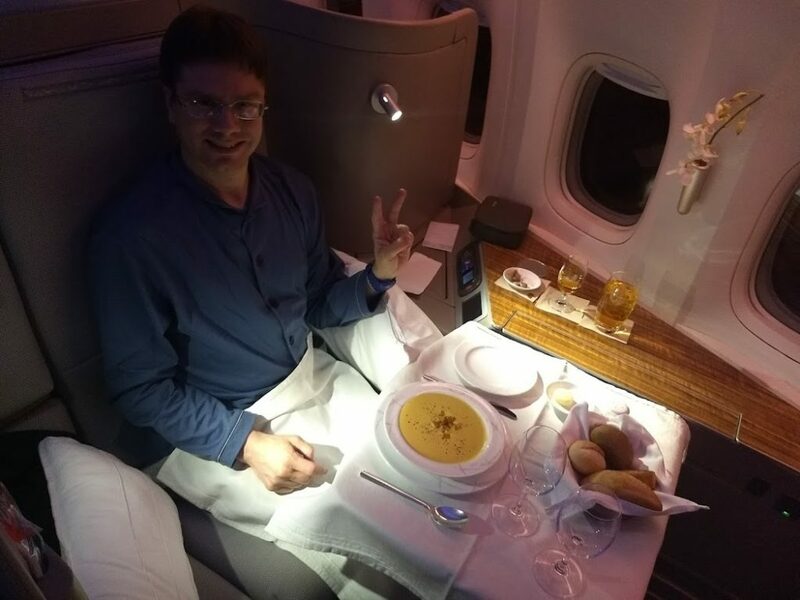 The cost is 62,500 points if you can find space the whole way in business class. The economy class fare? 50,000 points. And it’s 55,000 points in premium economy (which, to me, is an absolute no-brainer given how much better this is than economy class). So it’s only 15,000 more points to go first class than it is to go in premium economy class. Don’t get me wrong, Cathay Pacific has a pretty decent economy class (although it’s cramped at 10 across), but first and business class are a lot nicer. It’s hard for me to sleep well in economy class so I feel trashed the first day of the trip, but if I have a lie flat bed, I can arrive refreshed and ready to go. There is real value in what is effectively an additional vacation day. This price is one of those “almost too good to be true” and also “too good to last” sweet spots on the Alaska award chart. It is widely considered to be the best “sweet spot” award in the airline industry. These existed for a couple of years with American Airlines awards too (where it was significantly cheaper to book American Airlines awards with Alaska Mileage Plan points than it was to book with American AAdvantage points), but eventually their larger partner realized what was going on and dropped the hammer. Alaska is getting too big to keep “flying under the radar” so I expect that fairly soon, the award chart will devalue. This has already happened with Emirates and American so it is bound to happen with Cathay Pacific as well. So, not only is the pricing a really good deal, it’s a deal that I don’t think is likely to last. What do you do with exceptionally good award chart sweet spots that aren’t likely to last? It’s not an automatic “book them!” but for a 20k mile differential, I think getting an extra day out of the trip is absolutely worth it. A lie flat seat allows your arrival day in South Africa not to be one where you arrive stiff and sore, completely disoriented, after having spent 27+ hours in the air. I don’t want to trivialize 20k miles – you can do two roundtrips from Seattle to San Francisco for that on the Alaska award chart. But the value of what I can get out of 20k miles is about $480, at the 2.4 cents per mile I can usually squeeze out of Alaska miles. Remember how I value miles: not in terms of the cash price of a premium cabin award, but in terms of what I would have spent in cash on a flight. The hardest part of booking this award is finding availability. It is almost never there. In fact, award tickets to South Africa on Cathay Pacific are practically a unicorn. This is a tough route even in economy class. However, when I went to look, there were two seats open from Hong Kong to Johannesburg in business class on December 28th. When you’re booking to South Africa in the austral summer, this is one of the hardest award tickets to get and it was staring at me in the face. The only thing I needed to do was find a flight to Hong Kong on December 26th (necessary given the timing) that could connect up with it. I didn’t expect that I’d be able to find anything, but I started searching availability from Cathay Pacific’s gateways on the West Coast. These are Vancouver, Los Angeles, and San Francisco. I could go in business class on the 25th and Alaska Airlines does allow stopovers in Hong Kong, but I’d miss Christmas with my family which was a non-starter. From Los Angeles, there was a flight, but it got into Hong Kong after the Johannesburg flight left. And then, I saw it: a single first class seat available from San Francisco to Hong Kong. Nothing was available in business class, but first class was potentially available. I say potentially because Alaska Airlines has access to a more limited set of award inventory than Cathay Pacific’s Oneworld partners. I use British Airways’ site to search for availability and while Alaska pretty much never has access to inventory when British Airways lacks it, British Airways can have access to inventory that isn’t available to Alaska Airlines. It’s not unusual to see 4 seats available to British Airways members while Alaska may have only one or two seats available. However, I called up Alaska, and they were able to see the seats I found along with an Alaska flight from Seattle to connect up with it. I booked immediately. It’s a rare occasion indeed that you’ll find me here. It’s worth pointing out that British Airways also had an option available in premium economy. But this cost 60,000 points and $478 in taxes and fuel surcharges. There is also a very long layover in London, and I’d be there in December. I considered this option to be a non-starter. Had I been able to find BA inventory in economy class, it would have cost me $288 out of pocket and 50k miles. The #1 rule for getting the best award is “book the award that is actually available.” Ignore theoretical numbers on an award chart: live inventory is what really counts. I had a specific time frame when I wanted to fly and there was award availability with no fuel surcharges in first/business class, but not in economy class. There was a premium cabin “sweet spot” on the award chart that aligned with award inventory. This very rarely happens, so when it does, it’s worth strongly considering. Corollary: This is a very hard “sweet spot” to actually book and it is one that is likely to disappear soon. Availability is exceptionally rare. So this merits even more strong consideration. No fuel surcharges apply when redeeming Alaska Airlines Mileage Plan miles on Cathay Pacific versus other programs. I had a higher mileage balance in the Alaska program than I was comfortable maintaining. For me, it was a no-brainer to book this. Why? I won’t overlook travel in premium cabins even though I normally conserve my miles, and I don’t feel comfortable concentrating too many miles in a single program. Even though it’s awfully expensive to spend so many miles, I think this was an award worth spending the miles to get.